“After seeing the many Donna Karan and DKNY fan sites that were being created by anonymous people and joined by thousands, we have decided that the interest and enthusiasm for our brands deserves attention beyond what our websites provide. The ability to interact with our fans and potential new customers in this arena is very exciting”, says Patti Cohen, EVP of Global Marketing and Communications. As an additional forum for DKNY, “DKNY PR Girl” launched a profile on Twitter simultaneously. A link to her world will also be found on DKNY’s official Facebook page. “DKNY PR Girl” will give followers a real insider look into DKNY from the perspective of a publicist in NY for a brand truly rooted in New York. “DKNY PR Girl” will allow fans to be a fly on her wall, whether out at night, producing a runway show or working on a photo shoot. She will also let fans benefit from her insider knowledge and connections in the fashion industry. 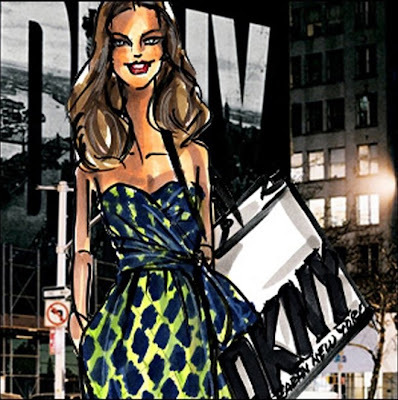 “DKNY PR Girl” is a savvy and fun character that will allow fans to really see behind the scenes at DKNY. DKNY is the energy and spirit of New York and “DKNY PR Girl” will invite followers to experience DKNY in an intimate, fun and informal way. DKNY PR girl looks more like a socialite than a fashion-industry type, but she might be interesting to follow. to tweet or not to tweet...? To tweet or not to tweet--that's been bugging me too, these days. Most friends are into it and have been telling me to register. I always end up resisting (like I did with FB for the longest time) coz it adds another distraction to an already full day. But I gave in to FB so I'm thinking it's just a matter of time before they wear me down and I give in to Twitter as well. Haay, I have no will of my own, haha! And no life, if I keep track of other people living their own lives, haha! Re companies on FB: I know it's not allowed, but I see a lot, anyway. Even big-time international hotels are on FB! I guess the FB headquarters haven't found a way to police the site yet? Or maybe it's OK with them, whatever brings in more members? i tweet but i find it tedious. its not working out for me.